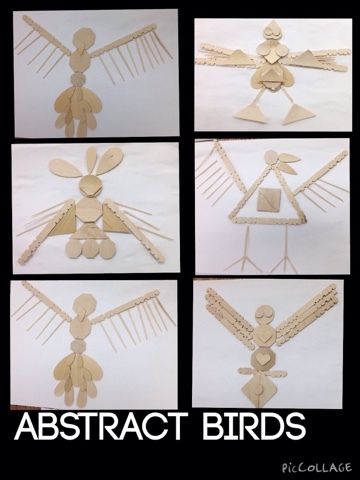 So I'm working on a bird unit with 4th Grade....and I thought it would be interesting to create assemblage abstract birds with them. The results had a very Native American/Thunderbird feel. I loved it!! Next week time we're going to paint them using analogous colors. I like this idea. Someone donated a bunch of that stuff to me. Thanks so much! THANK YOU!! I have TONS of different type wooden sticks that I always think I will find a way to use. Now I can.